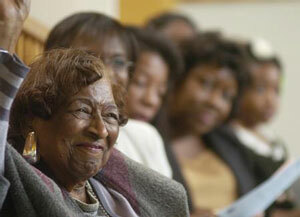 The Women’s Political Council (WPC) of Montgomery, Alabama was founded in 1946 by scholar and Alabama State College professor Mary Fair Burks. The Council was a political organization meant to fight the institutionalized racism of Montgomery, Alabama, and an organization that provided leadership opportunities for women. Burks was inspired to form the organization after a traffic dispute involving a white woman resulted in her arrest. In response she created a community organization that would teach local African Americans their constitutional rights and stimulate voter registration among them. Within a week Burks found forty women to join the organization, which they named the Women’s Political Council. They focused their efforts on the three areas of political action: education, and protest of segregated services. Burks was elected as the organization’s first president, a position she held for the next four years. By the 1950s the WPC had become one of the most active civil rights organizations in Montgomery. All three hundred of its members were registered to vote, which was a significant accomplishment for African American women at the time. Jo Ann Gibson Robinson, an English professor at Alabama State College, became president of the WPC in 1950. Under Robinson’s leadership, the WPC intensified their focus on bus reform. Members of the organization met several times with city officials throughout 1954 and 1955 in an effort to achieve better bus service. They had been considering a boycott of the Montgomery City Lines for years at the time of Rosa Parks’ arrest. After Rosa Parks refused to give up her bus seat to a white man on December 1, 1955, the WPC decided to put their plans into action by initiating a bus strike. They announced December 5 as the day of the strike, and religious leaders within the African American community agreed to support the boycott. The Montgomery buses were almost empty on the morning of December 5. Religious leaders met that afternoon and organized the Montgomery Improvement Association (MIA), electing Dr. Martin Luther King Jr., pastor of Dexter Avenue Baptist Church, as their leader. Robinson served on the executive board of the MIA and edited its newspaper. In February 1956, four women, Aurelia Browder, Claudette Colvin, Mary Louise Smith, and Susie McDonald filed a lawsuit in Federal court, claiming that racially segregated buses violated the Fourteenth Amendment. Two of the three judge federal panel hearing the case sided with Browder, the lead plaintiff. The defense appealed the case to the United States Supreme Court, and the boycott continued. On December 5, 1956, the Supreme Court upheld the lower court’s earlier decision. The thirteen-month boycott had been successful in desegregating Montgomery’s buses. After the boycott, the older generation of the WPC agreed to continue working to improve the difficulties faced by African Americans in the South, while at the same time teaching a younger generation of women to work for racial justice.